Today’s card comes from the Legacy of the Divine Tarot by Ciro Marchetti. 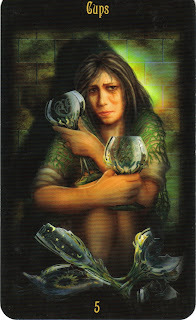 It is the Five of Cups, a card of feeling distressed, loss and possibly feeling disappointment. Even though this doesn't sound positive, read on to better understand the message that's here for you today. I know this isn't the most positive-looking card, but when I pull what seem to be "negative" cards, it reminds me of when I read my horoscope and it doesn't sound great. For some reason I find comfort in knowing that the situation and the associated feelings are not a surprise. It also reminds me that I will get through this. If reading about this card today invites you to feel nervous anticipating the Five of Cups energy, maybe you can find comfort from the fact that the card was pulled...and perhaps by simply knowing this, it will make it easier to get through it, grow from it and move on. The message I give to all of my clients is that we all have free will. Sometimes knowing ahead of time helps me to better navigate (or avoid) the situation and/or my reactions to it. The heads-up helps to prepare me. Hopefully it will do the same for you. The Five of Cups is a card of loss, disappointment, feeling distressed and wondering where things went wrong. Cups signify emotions and in the card above, you can see that three of the cups are broken and she is desperately hanging onto the other two (that are empty). If you find yourself in a situation that has left you feeling regretful, blaming yourself, sad, and disappointed, this is the energy of the Five of Cups. One thing that is comforting about this and any other Minor Arcana card (Ace through 10 in all four suits), is that it is a situation in our life that usually comes and goes. It is part of a larger cycle, and in the case of this card, the cycle involves emotions (Cups). The energy of a Minor Arcana card is like a mood that can come on and leave just as quickly. So don't get too stuck in this energy. Acknowledge it; sit with your feelings and see what's there for you. Sometimes being with your feelings can be very therapeutic. "You can clutch the past so tightly to your chest that it leaves your arms too full to embrace the present." (by Jan Glidewell, as quoted in the Academy of Yoga newsletter). If you have Five of Cups feelings today, recently, or experience them in the next couple of days, feel your feelings. Acknowledge how you are feeling by writing in a journal or talking to a good friend. Ponder what's there for you to experience and learn...and then let it go. Move onto the next phase of your growth and learning cycle. It's only when we unnecessarily prolong our Five of Cups feelings that we can get stuck. As my sister used to remind me when I was going through a tough time, "The sun will rise again tomorrow..." and it will...no matter how difficult the Five of Cups possibly feels right now. And know that this card also signifies that no matter how sad you feel, there is something that remains to be salvaged from the situation. Your job is to move through it and figure out what is here for you to learn...and then move on. Thanks for the reminder to sit with teh feelings and then let them go, Sheri. It's a very helpful image. I've been holding on desperately to the past. But this week has brought a new energy, a certain strength, and I'm starting to feel back on track. This card and your analysis reminds me to continue to grow through this time and not "stall out." Thanks, Sheri. This feels very pertinent to me as I journey through my divorce recovery class/group. Tonight is the second meeting. I have found myself avoiding my "homework" and dreading the class because of the feelings that may come up, the feelings that are just below the surface. I know that the pain will not last forever, though, and that the more I can face it head on, the easier I will pass through it. Thanks, Sheri. I love the community you are building here, Sheri, as I enjoy the comments as much as the post! Maddy made me laugh, and Loralie spoke to me. "Acknowledge it; sit with your feelings...let it go." When I remember to do this, it works really well. Emotions are meant to be in motion, moving THROUGH and not getting stuck in me. I connect deeply with this card. I am exactly in that energy. Problems in my present situation are dredging up unresolved emotions from the past. As I was reading this it became very clear to me that I've acknowledged these feelings and have been stuck in them. It's time to let them go. As always Sheri, you bring me clarity and comfort. This card resonates in so many areas of my life right now, it feels like a theme. Mostly it is a reminder to LET GO of the past so that I can make room for the future I want. The hard part of completely letting go, is the acceptance of... why is this it so hard to accept??? to let go of my idea of who I am so I can be who I've become? Somehow I've found myself in my mid 40's - mid life - wondering - how the f..; did that happen? And having to face that there is no turning back - nothing I can do to change it. Why does that suddenly feel like such a hard pill to swallow? ps. Sheri, you mentioned that you read your horoscope. Do you have a specific one you read like out of the newspaper? I always wonder how authentic they are. It's ironic that you pulled this card. I've been dating a new guy for three weeks and we were seeing each other 2-3 times a week and loving all the great times together. It got serious very fast and I tried to slow it down after the first week. He seemed to like the pace. On Monday, my intuition told me that he was disengaging. He called Tuesday (after I saw the reading) and told me he wanted to slow it down and start all over. for each of us, we are the first "dates" after ending a marriage/long-term relationship and neither of us thought we'd get involved so soon. He suggested we date other people and still continue but on a "friends first" basis. I was hurt and feeling another loss after ending my marriage last fall. I feel like the woman seeing the broken cups and holding on to the two remaining. I'm not sure if the card is more about me letting go completely of the failed marriage or the disappointment of the 3-week spiritual contract with this man that has been so healing that may be ending. I guess only time will tell. I realize I have to be vulnerable to have an open heart.